I do my best to try and stay organized in my home, and that is why I love the Dollar Store. You can buy inexpensive items that make keeping your clutter organized so that each item has a place. I have created a list of the top Dollar Store organization ideas to help you get your home clutter free! These Dollar Store organizational ideas will help give you inspiration. You don’t have to spend hundreds or even thousands of dollars for ways to keep your home organized. Head out to your Dollar Store and shop around for the items you see below. 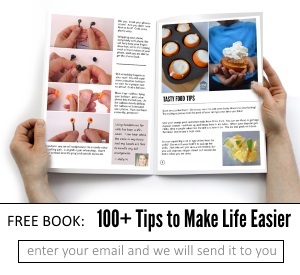 It might also give you the inspiration to look at products you find in a different way, and will allow you to think outside the box on what you could use it for! 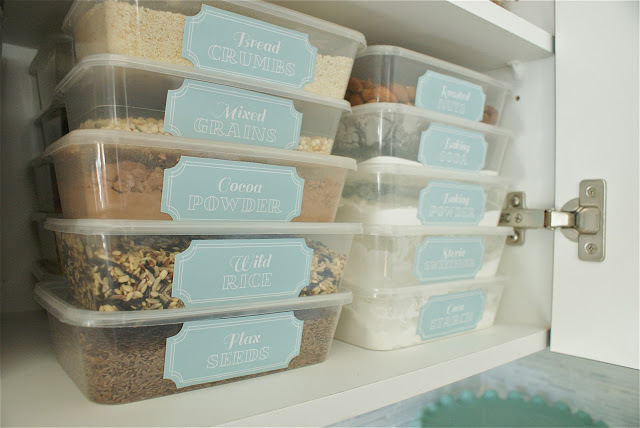 If your pantry needs a little “TLC” then grab some containers (The Social Home) with lids. These are great to store your staple items like oatmeal, rice, dried beans, flour, etc. They help free up space from bulky boxes and look great. I love the glass jars with lids, they work great. Buy some labels and you’re good to go. Grab some wicker style containers and hang them on your wall, to store towels (Making Lemonade). This is a great way to make useful space, and add a little decoration to your bathroom. 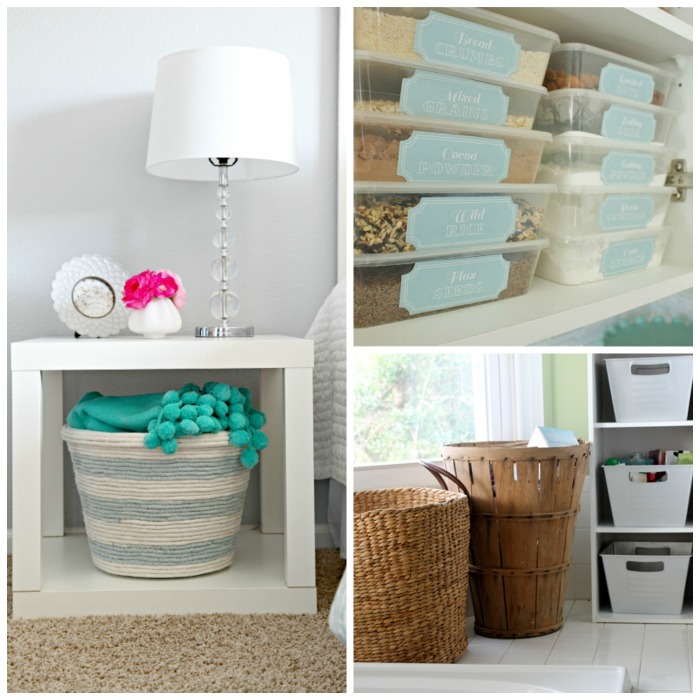 Grab some plastic bins and do a makeover (The Country Chic Cottage), to give a more sophisticated feel. You can buy any color of bins, grab your can of spray paint and you have a new look that is super affordable. Then store any items you want to be hidden from the eye. Whether it be bathroom products, your kid’s toys, kitchen goods, you name it, you can make it work. Use the rings you buy for shower curtains and transform it into a scarf holder on a hanger (From the Desk). This will help take up minimal space in your closet and allow you to easily access any scarf you want. If you have children, this one might be great. 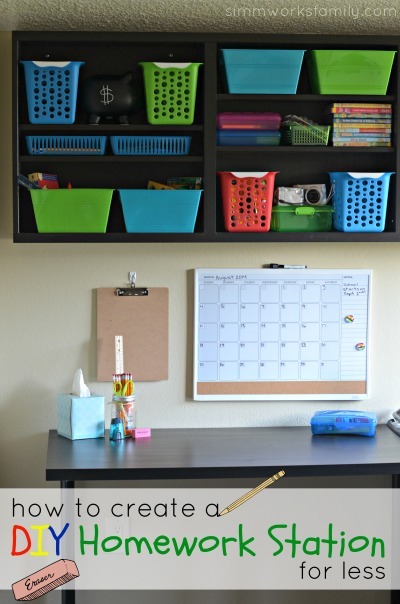 Create a homework station (A Crafty Spoonful) that is great for your child to sit down and focus on school work. Add any school or craft supplies your child might need. I find that when kids have a designated spot to work, it helps them really zone in on work. Spices can become a crazy mess in no time flat. Create a little organization with some inexpensive jars and a chalkboard label (A Cultivated Nest) on top. 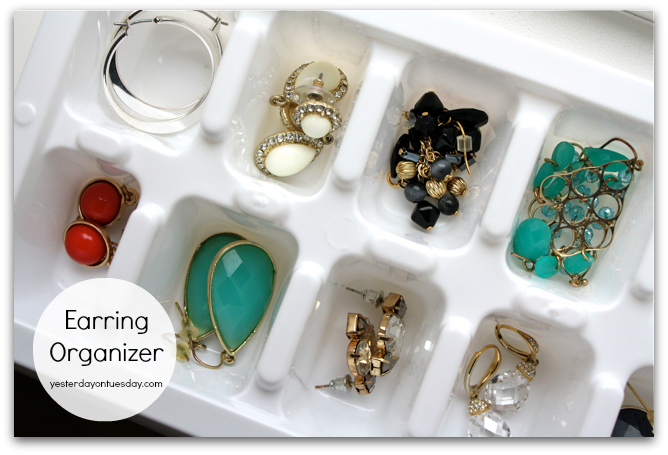 Grab an inexpensive ice cube tray and use it to store your smaller jewelry (Yesterday On Tuesday) like earrings and rings! This is great if you have some throw blankets laying around that need a home or even some kids toys. 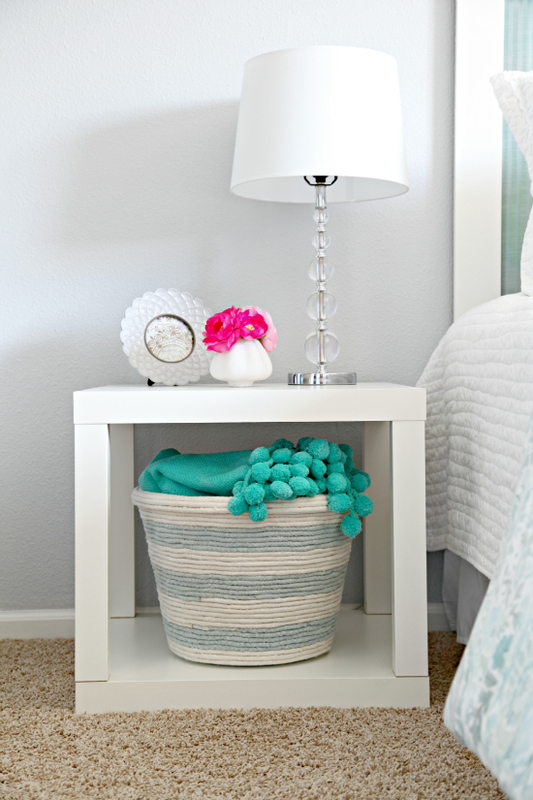 Take a plastic laundry basket (IHeart Organizing) and with a little rope, you can create a basket that is decorative and useful! Nothing is worse than piling up bath toys in the corner of your bathroom floor. Buy a laundry mesh bag and use it as a toy holder. They hang easily in your shower and works great for draining any water from toys. Just toss in washer to get clean. If the area under your sink is a piled mess, try this great idea for under sink organization! 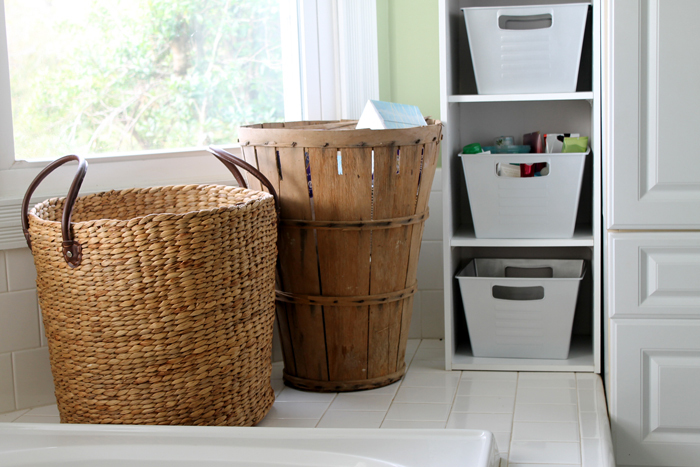 Use baskets and bins and curtain rods to help things cleaner and more organized. 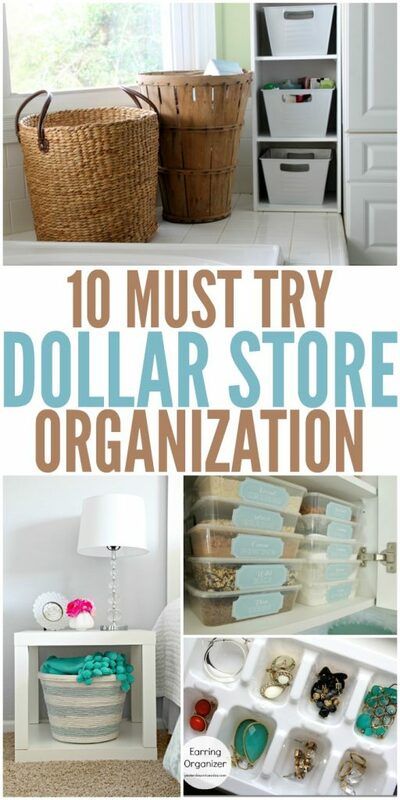 Use these dollar store organization ideas to inexpensively get your home organized in no time!